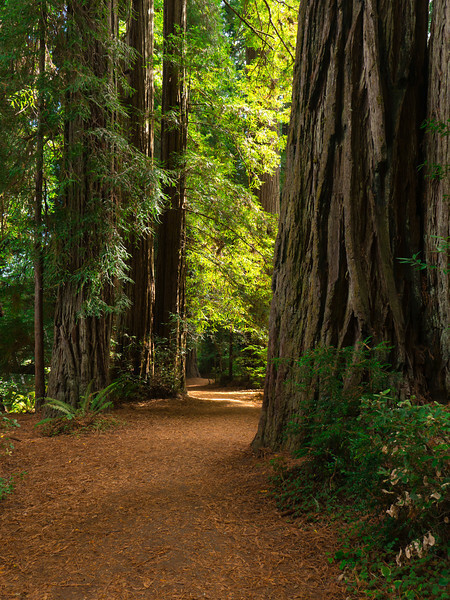 One of the big reasons I wanted to go to Northern California is to experience the redwoods. 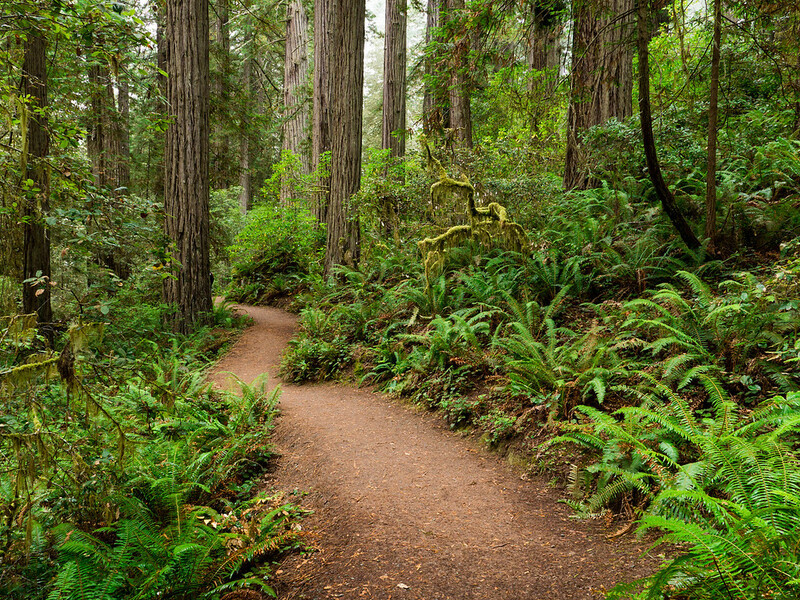 Sure, I’d been in forests in Big Sur. 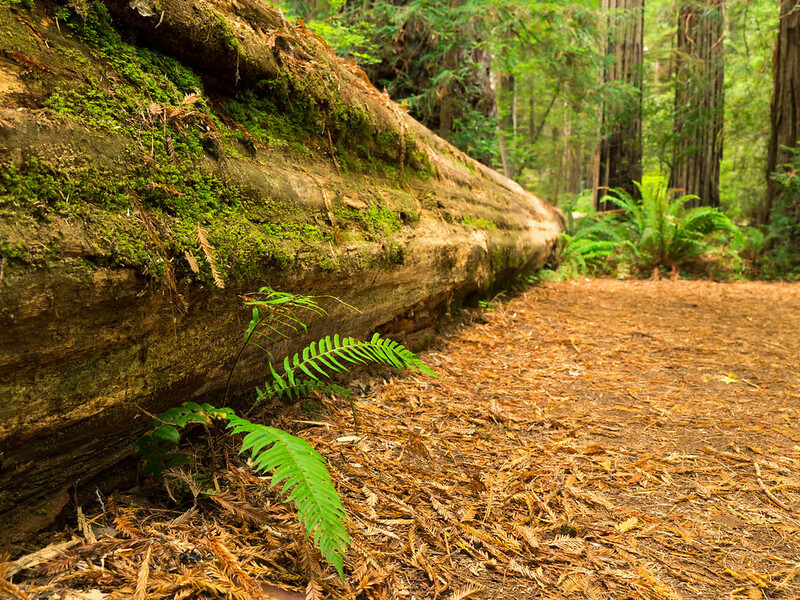 Alfred Molera and Garapatta State Parks, but those groves, while precious, are small and made up of all new growth. I wanted the big forests and if I got lucky, a few older growth groves. Trunks so big you could live inside one. Canopies that soar and soar out of sight and out of human scope. And fog. I envisioned fog. Boy, did I get my wish. If only I had gotten a few more days. 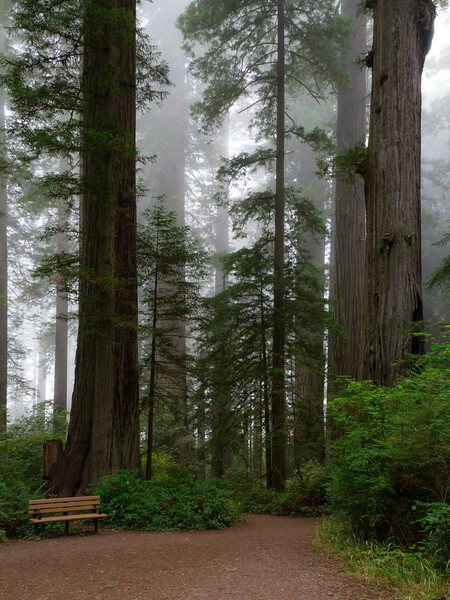 All the foggy shots were taken in the Lady Bird Johnson Grove which was dedicated by the First Lady in 1968 making it one of the first preserved redwood forests in all of California. 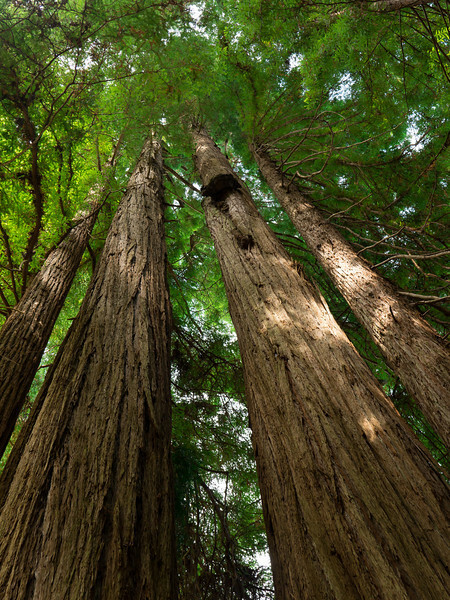 People were slow to protect these amazing trees, but now there are large, interconnected tracts that you can get lost in. 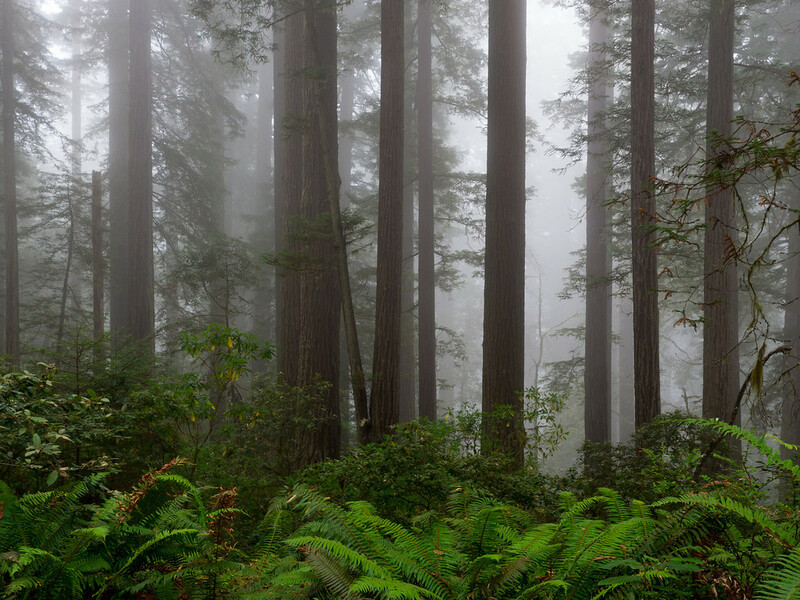 Even though this was the most crowded forest we visited, the fog just made it so special that I could ignore the traffic. 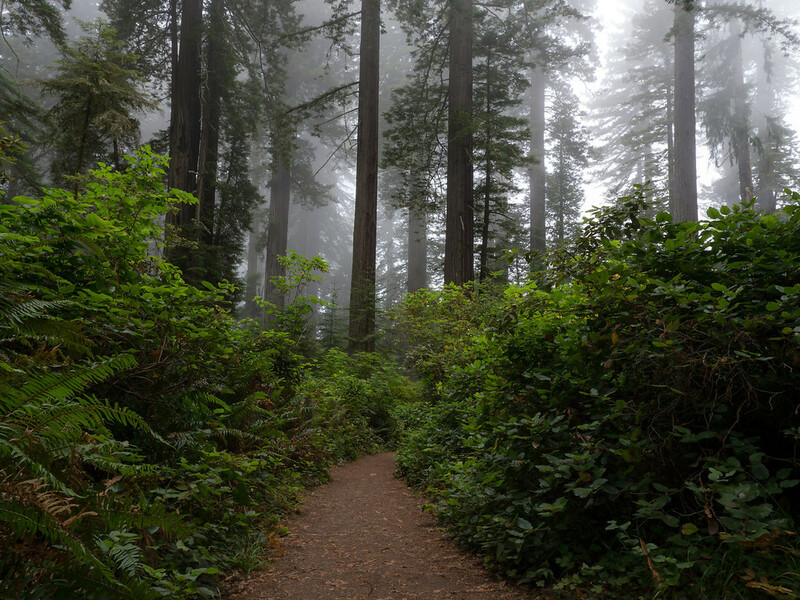 Coastal fog is essential to redwoods’ survival. 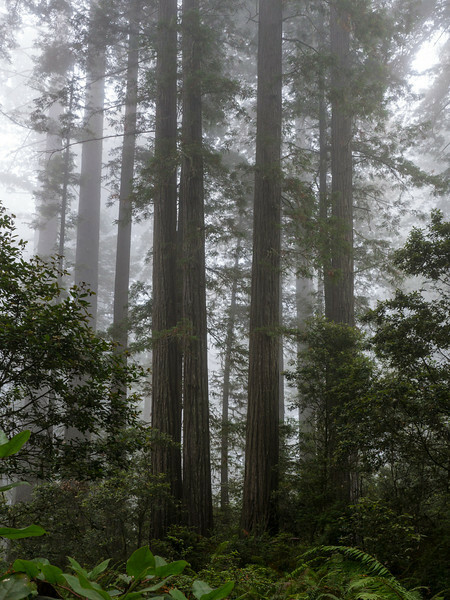 Not only does it help create a more temperate environment with stable temperatures, but in summer when there is reduced rainfall, the fog helps bring water to the canopy and protects against moisture loss in the massive surface area these trees have. As the fog condenses on the vegetation, it drips and flows into the bark, moss, lichens and eventually the forest floor itself. Even when the fog lifted, there was beauty so rich and otherworldly that I stopped about every 20 feet for another shot. This one has the camera off the tripod and me leaning on one of these massive beauties for support. 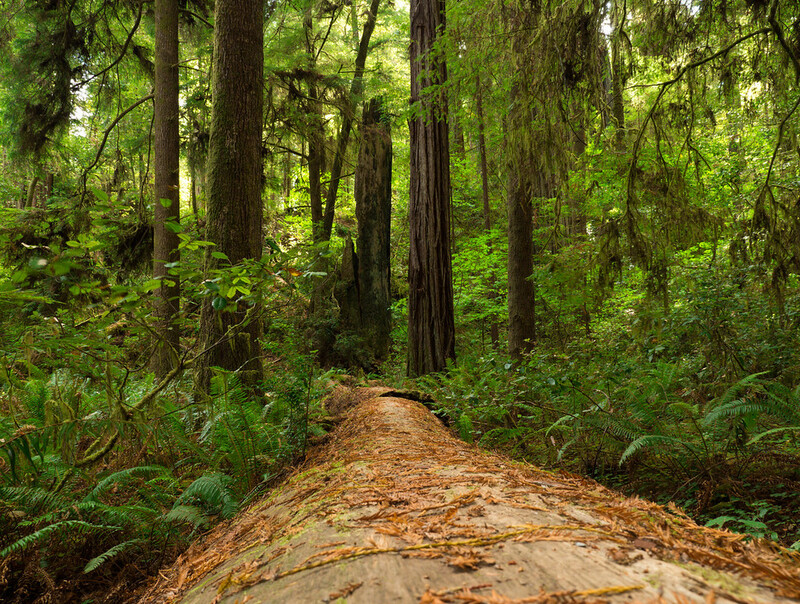 That was the Stout Grove which is in the Jedediah Smith Redwoods State Forest. There is the most amazing road snaking its way to this grove. We came in on the long side so got to wind through and around the tremendous trees. The light was very different and I did my best to emphasize how gorgeous it is in the canopy. One thing you may notice is the difference in the undergrowth from the Lady Bird Johnson Grove and here in Stout Grove. It’s much shorter and less dense. The sword ferns in most of the forests really dominate the lower landscape as well as rhododendrons. 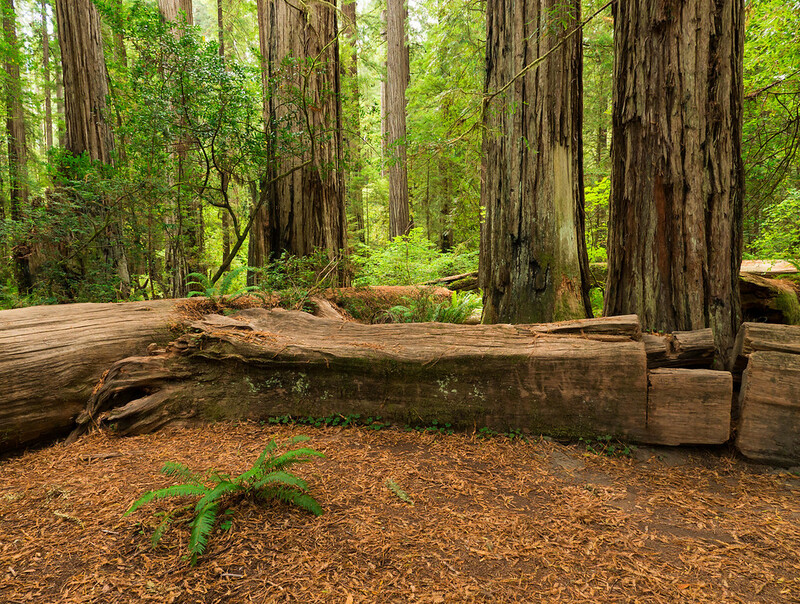 In Stout grove it’s less of a factor and instead it seemed there were more downed trees than anywhere else. I was fascinated with how they decay and lose their bark and their round shapes, becoming square and lying there like enormous Lincoln Logs. In addition to being fun to explore and great subjects to shoot, they made handy camera supports as well. Oh for a time machine so I could go back and be present during the storm that brought these elders crashing down. The noise. The power. The earth-shattering impact. Oh that would be something to behold. So if I haven’t convinced you that you should go witness these incredible trees firsthand, I don’t know what will. They are majestic beyond all human expression. So massive that you feel a similar humility as you do when next to whales. There isn’t that same sense of communication that I felt with whales, but there is an antiquity and a timelessness that only an ancient ecosystem can make you feel. These trees were alive long before my birth and they will remain alive long after my death. Their timescale as well as they physicality is outside of humanity in almost every way, except in the connection we have to the earth and the cycles of the sun. I’ve always been in awe of these giant trees. Beautiful images. I especially like the 3rd image. Headed there in March again. Favorite place to hike.